Anamik Makes Games | Anamik's Personal Blog | Independent Game Developer: Top 10 Characters of NightmareZ Indie Game - Explore The Game! Top 10 Characters of NightmareZ Indie Game - Explore The Game! I will also mention some hidden characters which will arrive in NightmareZ 2! The Characters as Players/ Helpers! 1. Razor: Razor is the main character of NightmareZ controlled by the player. Razor is the son of the great demon, Zaxina. He has his elder brother who is stronger than him but having arrogance for his superior power. Razor wants to protect the world for which he fought the evil demons. 2. Zaxina: Zaxina is the father of Razor and Uminoxina. He is the greatest warrior in feudal times. His mission was to destroy the evil forces. But he passed away(believed by the saint). However, it is still unknown whether Zaxina is really dead or he is still present in the world. 3. Uminoxina: Uminoxina is the son of the greatest warrior, Zaxina, and the elder brother of Razor. He went to hell many years ago to fight the evil demons all by himself. But he never returned from there. After a few years, his brother Razor took over his mission and started to destroy the enemies. However, he will meet his brother inside the Land of Hell at least for once while fighting Eye Demon. Such a tragedy. 4. Saint Nataraj: Saint Nataraj is also the main character of the game. Here, saint helped out Razor in some areas and he also know a lot about the family of Zaxina. He might be the principal character having distinct principles. 5. Flytime Red: Flytime Red is a fancy character playing the part of enemies. These creatures are capable of flying in every directions and they have a tendency to strike the player. 6. Flytime Blazer: Flytime Blaze also flies around the places and also tends to move towards the player. They try to eat away the player and they do so when they get a chance. 7. Fly Fish: FlyFish is a dangerous opponent and they fly really faster than Flytime Red and Blazers. They can cause serious damage to the player if they touch him. 8. 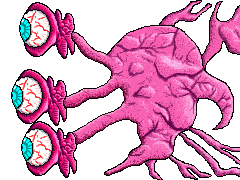 Eye Demon: Eye Demon is the powerful Mini boss of the game which can cause severe damage to the player in no-time. They are often powerful and throw a blue power which is really dangerous. 9. Three Headed Man: Three Headed Man, as appeared by the name, has three heads of different colors and they throw three laser bullets at a time. So, the player must be very careful since It is stronger and is not at all easy to destroy them. 10. BOSS: The BOSS is the strongest and fearsome enemy than any other bosses and mini-bosses. The BOSS is capable of throwing the Underworld power in the form of Underworld Energy Ball. These powers are very much effective even for a stronger opponent like Zaxina. The Boss consists of Three Eye Demon's power. These are the top Ten characters of NightmareZ Indie Game. If you have ever explored the game, then, don't forget to read this article. Purchase and Play this game. I am sure you will love it! This is an Indie Game Developed by Anamik Majumdar. This is one of the greatest Indie game ever published on AMAXANG GAMES. Are You Interested in buying this game? Click Here for more information. NightmareZ Indie Game Has Got Its FIRST REVIEW! NightmareZ Game Awaiting For Review By Youtubers!